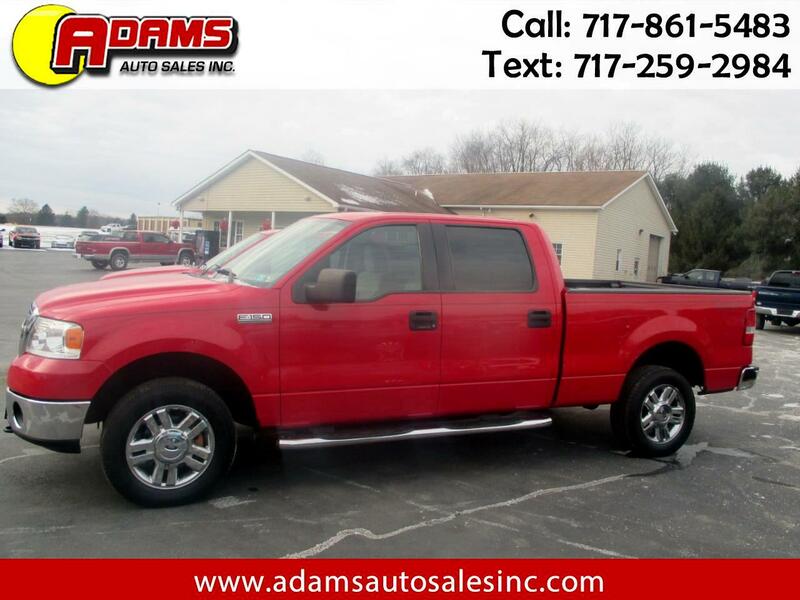 Used 2008 Ford F-150 4WD SuperCrew 139" XLT for Sale in Lebanon PA 17046 Adams Auto Sales Inc.
***RED HOT*** This 2008 Ford F150 Super Crew XLT w/short bed is a must see! It s equipped with a V8 5.4 liter engine and an automatic transmission. It is loaded with options like bed liner, keyless entry and running boards. It also has alloy wheels and a towing package. Only 123,275 original miles. The red exterior and gray interior are in great condition. Well maintained inside and out. Brand new inspection and emissions, good thru January of 2020. It comes with a 3 month / 4,000 miles (whichever occurs first) powertrain warranty. Ask a salesman for more details. Free Carfax report is available. Stop in and take it for attest drive. Don't wait because this beautiful 2008 Ford F150 Super Crew XLT won't last long!